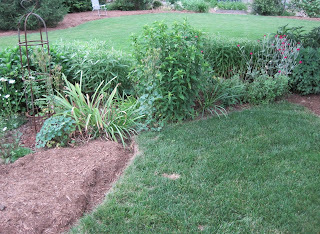 I originally posted about the backyard garden beds right after they were first outlined by the garden designer. Those beds have been mulched now and the garden seems much different, even without adding any new trees or shrubs. Without getting on the roof of the house, it is hard to capture the overall view of the garden beds and how they relate, so let me attempt to describe it all. Here you can see some new garden beds curving in to an existing bed. 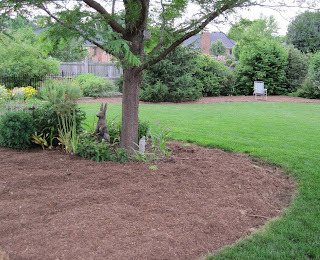 With my keen eye for design, (insert laughter here) I made this perennial flower bed one long, narrow, bed that went from the property line all the way across half the backyard to a honeylocust tree. The garden designer cut this bed into two beds, and widened them with big curves. 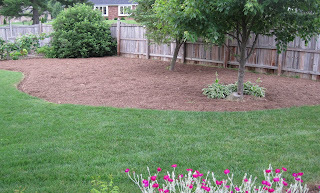 I'll need to remove the plants that will end up between the two garden beds and overseed that area with grass seed. This is not the ideal time to do that, so I may hold off until fall to move them. That's a better time to sow grass seed, too. But I might just move them this weekend and take my chances because I want to see how this area looks as two beds. But more likely I won't have time this weekend or the next or the next, so I'll do it in the fall. Here's how the new bed comes around the honeylocust tree. You can see how big it is compared to what was there before by where the plants are. That was the edge of the original bed. This is where I am going to park some of the planted containers from the patio while the patio is being rebuilt. Way off in the distance where that lawn chair is, there is another new bed ready for planting. That's where I like to sit in the evening, so I'll need a nice seating area there, with some comfortable chairs and a side table to rest my iced green tea glass on while I'm watching the garden, listening to birds. It might be my imagination, but already with the design changes, I think there are more birds in the garden. They were squawking at me this evening while I was picking strawberries. 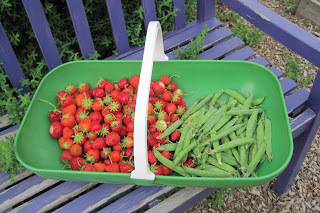 I think in bird language they were saying screaming "those are ours", "those are ours", but I just ignored them and kept picking the strawberries and the first of the shelling peas. The other big change in the garden is the new bed along the fence. I've wanted to put a garden bed there for the longest time, but always something stopped me. Family events, fear of garden bed commitment... who knows? Obviously, I've finally gotten rid of the excuses and vanquished my fears. It is done! It is big enough that there will be a path that leads through it, taking you from the gate by the house all the way to the new copse that will be planted there at the end of it, just to the other side of that large shrub. Finally, it is a bit difficult to see, but as you walk through the garden, all paths will lead to "the sanctuary" of the garden, my garden, my domain, where I am in charge (just ask the rabbits), the vegetable garden. There will eventually be something there to make that more of grand entrance. I'm very pleased with how these new beds are turning out, and can only imagine the changes once we (the garden designer) add new trees and shrubs and other plants. The garden is well-plotted, revealing itself slowly like a good book, with no straight lines or right angles anywhere until you reach the vegetable garden. It has that wanderability that I am looking for. - Let's include a plant for every letter of the alphabet! I could start out by alphabetizing a list of all the plants I currently have, and then fill in the blanks. - Let's go through my notes from when I took a Woody Ornamentals class in college "back in the day" and see what plants I put astericks by or noted that I wanted! Yes, I still have all my notes from that class which is a good thing because "back in the day" was, well, let's not say how long ago it was. Let's just say that I'm glad I have my old notes to help me remember some plants. I just need to be careful handling the paper because it is so old it is probably ready to turn to dust. - Let's ask my Top 50 favorite garden bloggers to send their suggestions! I've already gotten some suggestions from a few garden blogging friends. Keep 'em coming because if someone suggests a plant, I'm likely to always associate that person with that plant, as long as I have it growing in my garden. Which reminds me, I have a new Kerria japonica 'Alba' growing in my new front garden. It turns out that it is a passalong plant from my garden designer. Wasn't that extra nice of her to do that? Carol - your gardens look so great! I've always avoided using mulch, afraid to make the commitment (all in or all out, right?!? ); now I have your photos to spur me on. Your patio is also a source of inspiration - that's next year's project around "The Bunnies' Buffet". I love your designer's big sweeping beds! Oooo. So much room for a gardener to play. And the rabbit looks happy. Wonderful new beds to wander around and through. You have enough room for some wonderful shrubs as well as perennials. Your mowing will be much more interesting that just going back and forth, back and forth. It will be more like swirling around the ball room floor. Maybe you'll have more luck with a heather in your garden than I have in mine. They're really beautiful early bloomers here and a nice evergreen the rest of the time. But I've killed two and given up. It looks great! And you've got lots of room to plant a good variety of plants. Oooh, Carol - love the sheltered seating area that faces IN to your garden - and how cool to have such expansive borders for planting your heart's desires. This is so exciting! The new separation between the enlarged beds will work so well to turn what was a boundary into an invitation, making the elements of your land part of one whole garden. If you want to try heathers, go to Heathsandheathers.com. I think they must have the largest selection in North America. Most heathers want acid soil and mild winters, but I know they have some that are more tolerant of your conditions. Personally, I make an effort to put in shrubs with winter interest. Acer conspicuum 'Pheonix' has bright red striped bark. 'Scarlet Curls' willow has bark shading from yellow in the middle to red at the curling tips. It can be coppiced to maintain a shrublike size. Cornus sanguinea 'Midwinter Fire' also shades from yellow to red. Wouldn't they be striking against the snow?In summer they make a pleasant green background to colorful summer bloomers. The Cornus also has white flowers and berries. Some of my favorite shrubs (since you now have space for them) are shrubs roses (good, old-fashioned ones with fabulous fragrance) and Sky Pencil hollies (a wonderful upright accent plant that doesn't get out of control like some of the upright junipers). Whatever you plant, have fun - you have so much room to "play"! I like the shape of the garden beds and the size of your yard.. If it were mine, I would have to appoint one day out of a whole week, Mon-Sunday just to figure out where I would like to chill out!....Fun! Fun! Fun! 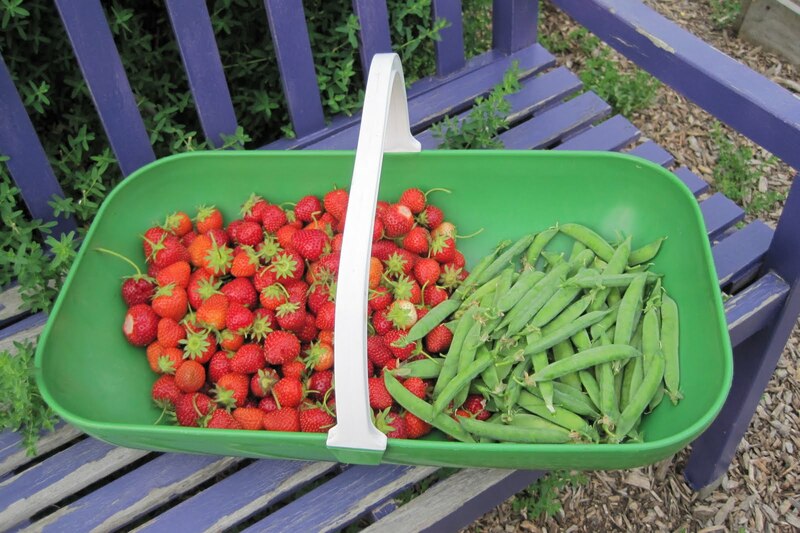 Carol how old is your gratuitous strawberry bed? I pluck a berry a day in year one and wasn't supposed to let it bloom, just runners. Couldn't help myself. I am no where near a full basket of berries. Your back yard looks huge, particularly in this day and age of tiny yards. Is this the first time you have really photo shown it? I with the winter interest too. Witch Hazels. I say plant some of those. I am positively giddy looking at that massive garden bed along the fence. Big enough to have a path through it! I love this idea and may have to incorporate it in my own yard. Can't wait to see how it turns out. Carol, it's all coming together splendidly. What a joy it will be for you to come home to after a day at the office! Like Christopher, I can't get over the size of your back yard. It's humongous! Lucky. Now you'll get to fill it with beautiful plants and still have room for a curvy, mowable lawn. wow! I really love your garden. Your exquisite gardening ideas are amazing.